Crepey skin is thin, finely-wrinkled skin that resembles crepe paper. Though it can affect other parts of the body, it’s most commonly found on the upper inner arms. The appearance of crepey skin—skin with the look and texture of crepe paper—can develop anywhere on the body, although it’s most common around the arms, followed by the cheeks, eyes, neck, hands, and legs. Crepey skin can be particularly troublesome on the arms. It’s common for people to ignore the skin on their arms in lieu of their face and neck, but it can cause inconsistencies in appearance, as the face appears smoother, healthier, and more youthful than the arms. The board-certified dermatologists at Cosmetic Laser Dermatology in San Diego offer various non-surgical treatments to re-volumize, rehydrate, and rejuvenate your crepey arm skin. A common cause of crepe-like skin is reduced production of collagen and elastin in the skin. These proteins keep the skin firm and pliable but without them, wrinkles form and skin laxity develops. Another cause of wrinkles is the loss of dermal moisture. As people age, fewer skin cells are produced, leading to the loss of important oils that help keep the skin free of dead skin cells and other pathogens. The loss of both skin-supporting proteins and skin hydration can occur as a result of aging and/or the accumulation of sun exposure. One other common cause for crepey arm skin is the loss of fat from the skin due to aging, such as from significant weight loss. This results in thinner skin that is more susceptible to wrinkling and crepey texture. San Diego’s Cosmetic Laser Dermatology offers several treatments designed to correct crepey skin and revitalize one’s appearance. The most effective treatments improve skin texture as well as help increase the reduced levels of collagen and elastin in the skin. The end results are smoother, younger-looking arms! 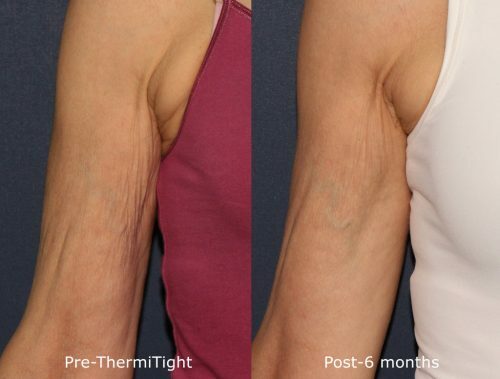 ThermiLift uses radiofrequency (RF) energy to effectively treat crepey skin. This revolutionary procedure gently sends the RF energy deep into the skin to jumpstart collagen and elastin production, which helps “lift” the skin and gives it a smoother, firmer appearance. In 2016, our own Dr. Mitchel Goldman and Dr. Douglas Wu led a study on the safety and effectiveness of RF energy on tightening lax, crepey arm skin using an emerging technology designed to be less invasive—subsurface thermistor-controlled monopolar radiofrequency (SMRF). SMRF is delivered via a ThermiRF probe safely and precisely thanks to the external infrared camera that allows for constant monitoring of skin temperature. They found there was a marked improvement in skin laxity, texture, and firmness at both 30 and 90 days post-procedure. Although further research is necessary, the benefits of this new technology look promising! CLDerm’s Dr. Sabrina Fabi helped pioneer crepey arm skin treatment with Ultherapy. This non-surgical procedure is designed to lift lax skin and stimulate the production of collagen. The secret to this procedure is focused fractionated ultrasound, which penetrates deep to strengthen and repair the skin’s support structure. As it’s nonsurgical, patients need not worry about incisions or ensuing scars. In fact, the procedure is relatively quick, is usually well tolerated, and requires almost no downtime. Ultherapy was the first non-surgical skin tightening treatment approved by the FDA for lifting and toning skin. The procedure is safe and precise because the imaging technology allows for precise targeting of the troublesome layer(s) to be treated. It’s customizable, so the appropriate levels of energy are consistently being delivered. The result is gradual, natural-looking improvement and skin rejuvenation that become fully evident after 4-5 months and last for over a year. Side effects such as redness, swelling, and tenderness are minimal due to the minimally-invasive nature of the treatment. With the main ingredient poly-L-lactic acid, the injectable dermal filler Sculptra is a non-invasive method of restoring skin fullness and volume by building collagen. It is very effective at adding volume to areas in the early stages of skin laxity. The filler reinforces the skin’s underlying support structure, which lifts the skin and gives the arm a revitalized appearance. Visit SculptraAesthetic.com to learn more about the injectable collagen stimulator.